Christine has worked for VIMS' Shoreline Studies Program since 2003 and is responsible for planning and managing the Program's GIS data. 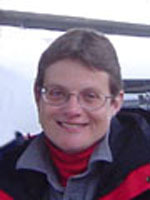 She not only captures data by georectifying or ortho-rectifying historical maps and aerial photography using ESRI ArcMap and ERDAS LPS, but also maintains all the shoreline management GIS data, including the recent and historical aerial photography and video collection. Chris also serves as the Shoreline Studies webmaster.